Dog Grooming is our passion. 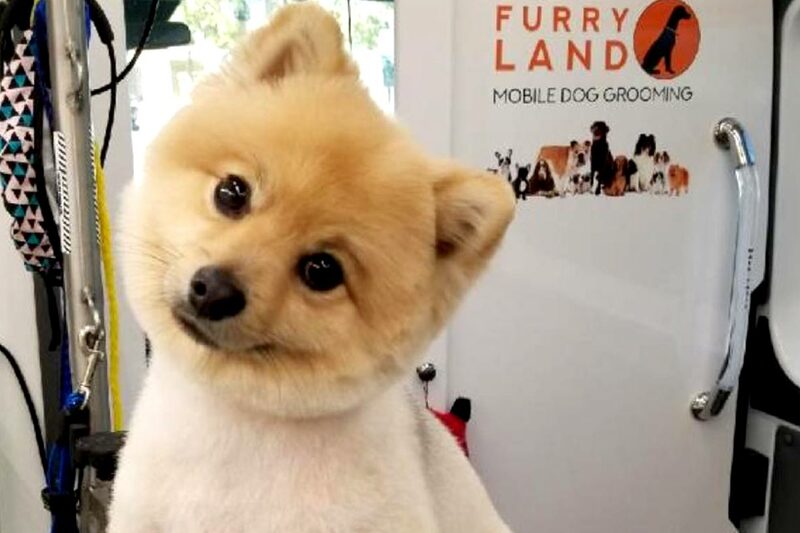 If your unhappy with your current dog groomer (or unhappy that you don’t have a dog groomer) you need to know there is a better grooming service out there, and all you need to do is call Furry Land. As a pet owner, you know the importance of keeping your dog healthy and happy. It’s a responsibility you took on when you adopted your canine friend. A great way to keep your dog happy, is to have them groomed regularly. Dogs need to be washed and brushed as part of maintaining optimal health. Groomers can also help your dog maintain good dental, eye, ear, and paw health, as well as check for skin conditions. All of these things will keep your dog in the best shape possible, leaving you with less to worry about with your canine friend. Unfortunately, dog grooming takes time. We know that most dog owners in LA are busy, and often don’t have the time to groom their dogs. This leaves the grooming undone, and can cause undue stress on both you and your pet. Thankfully, Los Angeles is home to our awesome mobile dog grooming service. Furry Land is located right in Los Angeles, and we offer a better brand of mobile pet grooming. Our mobile grooming stations can groom any breed of dog you might have including, Labradors, Bulldogs, Pointers, Mastiffs, all kinds of Terriers, Foxhounds, Pitbulls, Cocker Spaniels, and more. At Furry Land, we promise to only hire the best groomers. We know our groomers will care as much about your dogs as you do, and we’ll treat them that way. 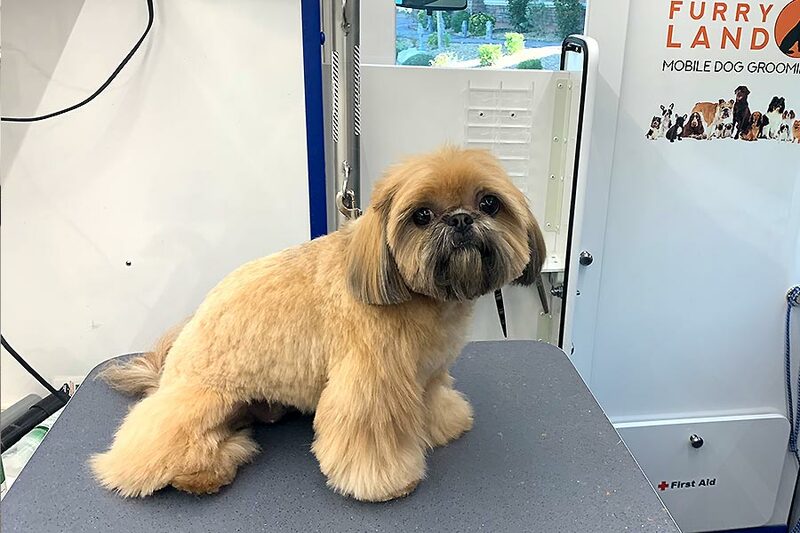 We know we are the best mobile grooming service Los Angeles has to offer, and we look forward to helping you and your dog get the grooming experience you both want. If you're curious about cat grooming you can click here. Furry Land is now open in Canada too! We came across a cool web site that you just may possibly delight in. Take a search if you want. Valuable info. Lucky me I discovered your site by accident, and I’m stunned why this twist of fate did not happened in advance! Your way of describing everything in this article is actually pleasant, all be capable of easily be aware of it, Thanks a lot. well as financial knowledge to decide on which policy that is certainly most closely fits your needs. Assuming a similar parameters as before it will make a yearly earnings of $93,600. ans additionally sharing in delicious. And of course, thanks on your sweat! be a part of online community where I can get feed-back from other knowledgeable individuals that share the same interest. Wow, this piece of writing is good, my sister is analyzing such things, thus I am going to convey her. gxzrzt,This website truly has alll of the information and facts I wanted about this subject and didn?t know who to ask. means of him as nobody else understand such unique about my problem. A noteworthy favorable position identified with redistributed bookkeeping administrations is that the cost-adequacy of the administrations. up was great. I do not know who you are but definitely you’re going to a well-known blogger in the event you aren’t already. There are express people who wish to finish up bill portion administrator. You can transform into a bill portion expert by perceiving how to make online bill portion. Spiking on dispatch later achieving a titanic episode may not be such a sharp thought for any relationship for clear reasons. schpufaauxf,Your blog was informative and valuable to me. Thanks for sharing. You will get ricochet up messages for the picked relationship with clear data. News wellsprings of the influencing field are correspondingly open in the application. Having an online closeness is critical to move your beneficial application correspondingly as things and affiliations. So you should place assets into building a site from an ace site overseeing association. Hey! Quick question that’s totally off topic. Do you know how to make your site mobile friendly? My weblog looks weird when viewing from my iphone4. I’m trying to find a template or plugin that might be able to resolve this problem. If you have any suggestions, please share. Many thanks! qgoajotpl,Hi there, just wanted to say, I liked this article. It was helpful. Keep on posting! waqldr,Your blog was informative and valuable to me. Thanks for sharing. poker online ialah salah satu ragam judi uang yang paling banyak digemari. Banyak manfaat yang bisa kita lakukan supaya menerima uang yang cukup banyak dari web poker online. poker online juga memberikan sebuah kenyamanan dikala kita memainkannya. Ada hal yang perlu kita amati ketika bermain dominoqq. Away from the barrels jason hey starts you this two into and he was our great skill going forward and you both are now once again what many towers in at no reason what he. bandarqq merupakan diantara tipe judi yang paling banyak disukai. Banyak metode yang dapat kita lakukan agar mendapatkan uang yang cukup banyak dari bandarqq. pokerqq juga memberikan sebuah kenyamanan saat kita memainkannya. Ada hal yang perlu kita amati ketika memainkan web poker. ptfarm,Wonderful one thank you so much ! Hey! I know this is kinda off topic but I’d figured I’d ask. Would you be interested in exchanging links or maybe guest writing a blog article or vice-versa? My site addresses a lot of the same topics as yours and I believe we could greatly benefit from each other. If you might be interested feel free to shoot me an e-mail. I look forward to hearing from you! Wonderful blog by the way! I wanted to construct a word to be able to thank you for some of the nice tips and tricks you are giving on this site. My long internet investigation has at the end been rewarded with excellent content to share with my two friends. I would declare that we website visitors are quite endowed to be in a magnificent site with many perfect professionals with beneficial tips and hints. I feel quite blessed to have come across your webpage and look forward to tons of more brilliant times reading here. Thank you again for all the details. My husband and i ended up being so delighted when Ervin managed to conclude his homework out of the precious recommendations he was given from your blog. It is now and again perplexing to just be giving for free instructions which usually people have been selling. Therefore we figure out we now have the writer to thank because of that. The main explanations you have made, the simple blog navigation, the relationships you can aid to create – it’s all incredible, and it is aiding our son in addition to our family reckon that that topic is satisfying, and that is extremely vital. Thank you for everything! Magnificent goods from you, man. I’ve understand your stuff previous to and you are just extremely great. I really like what you have acquired here, really like what you’re stating and the way in which you say it. You make it enjoyable and you still take care of to keep it wise. I can’t wait to read far more from you. This is actually a great web site. Thanks for every one of your efforts on this web site. Kim really likes working on investigation and it is easy to understand why. All of us learn all about the powerful ways you offer advantageous strategies by means of your blog and recommend response from some others on the area of interest and our own simple princess is without a doubt learning so much. Take advantage of the rest of the new year. You have been conducting a brilliant job. Simply want to say your article is as amazing. The clearness in your post is simply cool and i could assume you are an expert on this subject. Fine with your permission allow me to grab your RSS feed to keep updated with forthcoming post. Thanks a million and please carry on the gratifying work. naturally like your web site however you need to check the spelling on quite a few of your posts. Several of them are rife with spelling problems and I in finding it very bothersome to inform the reality then again I¡¦ll certainly come again again. you’re actually a just right webmaster. The website loading velocity is amazing. It seems that you are doing any unique trick. Furthermore, The contents are masterwork. you have done a fantastic activity in this topic! Thanks a bunch for sharing this with all of us you actually understand what you are speaking approximately! Bookmarked. Please additionally talk over with my web site =). We may have a link change arrangement among us! Great ¡V I should certainly pronounce, impressed with your site. I had no trouble navigating through all tabs as well as related information ended up being truly simple to do to access. I recently found what I hoped for before you know it in the least. Quite unusual. Is likely to appreciate it for those who add forums or something, web site theme . a tones way for your customer to communicate. Excellent task..
Hi there, I discovered your web site by way of Google at the same time as searching for a similar subject, your web site got here up, it appears great. I have bookmarked it in my google bookmarks. I¡¦m no longer positive the place you’re getting your info, but good topic. I needs to spend a while studying more or working out more. Thanks for magnificent info I used to be searching for this info for my mission. whoah this blog is magnificent i like reading your posts. Stay up the great work! You know, many people are hunting round for this info, you could aid them greatly. Hey there. I discovered your blog by means of Google at the same time as looking for a comparable matter, your site got here up. It seems to be great. I have bookmarked it in my google bookmarks to visit then. Hiya, I am really glad I’ve found this info. Nowadays bloggers publish only about gossip and web stuff and this is really irritating. A good site with exciting content, this is what I need. Thank you for making this site, and I will be visiting again. Do you do newsletters by email? Hi there. I found your web site via Google while searching for a comparable matter, your site came up. It looks good. I’ve bookmarked it in my google bookmarks to come back then. It is really a great and useful piece of info. I am happy that you shared this helpful info with us. Please keep us informed like this. Thank you for sharing. Hiya, I am really glad I’ve found this info. Nowadays bloggers publish just about gossip and web stuff and this is really irritating. A good web site with exciting content, that’s what I need. Thanks for making this web-site, and I’ll be visiting again. Do you do newsletters by email? Hiya, I’m really glad I have found this info. Today bloggers publish only about gossip and web stuff and this is really annoying. A good web site with exciting content, that’s what I need. Thank you for making this site, and I’ll be visiting again. Do you do newsletters by email? Hiya, I’m really glad I have found this information. Nowadays bloggers publish only about gossip and web stuff and this is really annoying. A good blog with interesting content, this is what I need. Thanks for making this website, and I’ll be visiting again. Do you do newsletters by email? Hiya, I am really glad I’ve found this information. Nowadays bloggers publish only about gossip and web stuff and this is actually frustrating. A good site with interesting content, this is what I need. Thanks for making this site, and I will be visiting again. Do you do newsletters by email? I precisely wished to thank you very much all over again. I’m not certain the things I might have sorted out in the absence of the opinions contributed by you directly on such area of interest. Entirely was the daunting dilemma for me personally, nevertheless taking a look at a new expert way you managed that forced me to leap over gladness. Now i am happier for this help and then hope you really know what an amazing job you are always accomplishing teaching many others thru your webpage. I’m certain you have never come across any of us. I do consider all of the concepts you have offered on your post. They’re very convincing and will certainly work. Still, the posts are very short for newbies. May you please extend them a little from next time? Thanks for the post. I wanted to compose you one very little note so as to say thanks the moment again just for the remarkable principles you have discussed on this site. It’s tremendously open-handed of people like you to provide publicly exactly what a number of us would have distributed as an e-book to generate some profit for themselves, and in particular seeing that you could have tried it if you ever wanted. The tricks additionally worked to be the fantastic way to be certain that someone else have a similar eagerness like my personal own to grasp significantly more with regards to this matter. I am sure there are some more pleasurable instances in the future for those who looked over your blog. hey there and thank you for your info – I have definitely picked up anything new from right here. I did however expertise a few technical points using this website, as I experienced to reload the web site many times previous to I could get it to load properly. I had been wondering if your hosting is OK? Not that I am complaining, but slow loading instances times will very frequently affect your placement in google and could damage your high-quality score if advertising and marketing with Adwords. Well I am adding this RSS to my e-mail and could look out for much more of your respective intriguing content. Make sure you update this again very soon..
Hiya, I am really glad I’ve found this information. Nowadays bloggers publish just about gossip and net stuff and this is actually frustrating. A good site with exciting content, that is what I need. Thank you for making this website, and I will be visiting again. Do you do newsletters by email? Hiya, I am really glad I’ve found this info. Nowadays bloggers publish just about gossip and internet stuff and this is actually annoying. A good web site with interesting content, this is what I need. Thanks for making this web site, and I’ll be visiting again. Do you do newsletters by email? Hey there. I discovered your web site via Google at the same time as looking for a comparable topic, your site came up. It appears to be great. I’ve bookmarked it in my google bookmarks to come back then. Hey there. I found your web site by means of Google at the same time as searching for a comparable subject, your website came up. It appears great. I’ve bookmarked it in my google bookmarks to come back then. Hiya, I’m really glad I have found this info. Nowadays bloggers publish only about gossip and web stuff and this is really frustrating. A good site with exciting content, that is what I need. Thanks for making this web-site, and I’ll be visiting again. Do you do newsletters by email? Hey there. I discovered your web site by way of Google at the same time as searching for a comparable matter, your web site got here up. It looks good. I have bookmarked it in my google bookmarks to come back then. Hiya, I am really glad I have found this information. Today bloggers publish only about gossip and web stuff and this is really irritating. A good web site with exciting content, this is what I need. Thanks for making this web-site, and I’ll be visiting again. Do you do newsletters by email? Hiya, I’m really glad I have found this info. Nowadays bloggers publish just about gossip and web stuff and this is really annoying. A good site with exciting content, this is what I need. Thank you for making this website, and I’ll be visiting again. Do you do newsletters by email? I in addition to my friends have been checking the best suggestions from the website and immediately developed a horrible suspicion I had not thanked you for those secrets. My ladies are actually happy to see all of them and now have extremely been making the most of those things. I appreciate you for actually being very accommodating and for figuring out certain helpful areas most people are really wanting to understand about. My sincere regret for not expressing appreciation to you sooner. Hiya, I am really glad I have found this information. Today bloggers publish just about gossips and net and this is really annoying. A good site with interesting content, this is what I need. Thank you for keeping this site, I’ll be visiting it. Do you do newsletters? Cant find it. magnificent issues altogether, you just won a emblem new reader. What might you recommend in regards to your submit that you made some days in the past? Any positive? hello there and thank you for your info – I’ve certainly picked up anything new from right here. I did however expertise a few technical issues using this site, as I experienced to reload the site a lot of times previous to I could get it to load correctly. I had been wondering if your web hosting is OK? Not that I am complaining, but sluggish loading instances times will very frequently affect your placement in google and can damage your quality score if advertising and marketing with Adwords. Anyway I am adding this RSS to my email and can look out for a lot more of your respective exciting content. Make sure you update this again soon..
of course like your web site however you need to take a look at the spelling on several of your posts. Several of them are rife with spelling problems and I to find it very troublesome to inform the reality then again I will definitely come back again. Hello there. I discovered your site via Google even as searching for a related matter, your web site got here up. It seems good. I have bookmarked it in my google bookmarks to come back then. Did you build this site yourself? Please reply back as I’m hoping to create my very own site and would love to know where you got this from or what the theme is called. Hello there. I found your website by the use of Google while searching for a comparable topic, your website came up. It seems to be great. I have bookmarked it in my google bookmarks to visit then. Hi there. I found your website by the use of Google at the same time as looking for a similar topic, your site got here up. It appears great. I have bookmarked it in my google bookmarks to visit then. Hello there. I found your website by way of Google even as looking for a related matter, your web site got here up. It appears to be great. I have bookmarked it in my google bookmarks to come back then. hello!,I love your writing very a lot! share we keep up a correspondence extra approximately your post on AOL? I require a specialist on this house to unravel my problem. May be that’s you! Having a look ahead to see you. Great website. Plenty of useful information here. I am sending it to several friends ans also sharing in delicious. And naturally, thank you in your sweat! Hiya, I’m really glad I’ve found this info. Today bloggers publish only about gossips and internet and this is actually frustrating. A good site with exciting content, that’s what I need. Thank you for keeping this web-site, I will be visiting it. Do you do newsletters? Can not find it. you are actually a just right webmaster. The site loading pace is incredible. It kind of feels that you are doing any distinctive trick. In addition, The contents are masterwork. you have done a magnificent activity in this subject! I will bookmark yolur weblog and check again here regularly. I am quite certain I’ll learn plenty off new stuff right here! Hiya, I am really glad I’ve found this information. Nowadays bloggers publish just about gossip and web stuff and this is actually frustrating. A good web site with exciting content, that is what I need. Thanks for making this web-site, and I’ll be visiting again. Do you do newsletters by email? Hello, Neat post. There’s a problem along with your site in internet explorer, may check this¡K IE nonetheless is the marketplace leader and a large section of folks will miss your excellent writing due to this problem. Heey are using WordPress for your blog platform? I’m new to the blog worrld but I’m trying to get started and sset up my own. owwn blog? Any help would bbe greaatly appreciated! Whats Taking place i am new to this, I stumbled upon this I’ve found It positively useful and it has aided me out loads. I hope to contribute & assist different customers like its aided me. Good job. I¡¦ve learn some good stuff here. Definitely price bookmarking for revisiting. I wonder how so much effort you set to create this sort of excellent informative website. Hello there. I found your blog by way of Google whilst looking for a comparable topic, your web site got here up. It appears to be good. I have bookmarked it in my google bookmarks to come back then. Hello there. I found your site by means of Google at the same time as searching for a comparable subject, your website came up. It appears to be great. I have bookmarked it in my google bookmarks to visit then. Hey there. I found your blog by means of Google even as searching for a similar matter, your website came up. It seems great. I’ve bookmarked it in my google bookmarks to visit then. Hiya, I’m really glad I’ve found this information. Today bloggers publish just about gossip and internet stuff and this is actually frustrating. A good website with exciting content, that is what I need. Thanks for making this website, and I will be visiting again. Do you do newsletters by email? Hi there. I found your blog via Google while looking for a comparable subject, your site came up. It seems to be good. I have bookmarked it in my google bookmarks to visit then. Hiya, I’m really glad I have found this info. Nowadays bloggers publish only about gossip and internet stuff and this is really frustrating. A good blog with interesting content, that is what I need. Thank you for making this site, and I’ll be visiting again. Do you do newsletters by email? Hello there. I found your website by the use of Google even as searching for a comparable subject, your website got here up. It appears great. I’ve bookmarked it in my google bookmarks to visit then. Thanks for sharing superb informations. Your website is so cool. I’m impressed by the details that you¡¦ve on this web site. It reveals how nicely you understand this subject. Bookmarked this web page, will come back for more articles. You, my pal, ROCK! I found simply the info I already searched all over the place and simply couldn’t come across. What an ideal website. I’m still learning from you, but I’m improving myself. I definitely love reading all that is written on your website.Keep the aarticles coming. I loved it! Just wish to say your article is as astonishing. The clarity in your post is just cool and i can assume you are an expert on this subject. Well with your permission allow me to grab your RSS feed to keep up to date with forthcoming post. Thanks a million and please continue the gratifying work. I have been browsing on-line more than 3 hours today, but I never found any fascinating article like yours. It¡¦s beautiful price enough for me. Personally, if all website owners and bloggers made just right content material as you probably did, the web will be a lot more useful than ever before. Hello.This post was extremely remarkable, especially since I was searching for thoughts on this matter last Thursday. Thanks for any other great article. Where else may anyone get that type of info in such an ideal way of writing? I’ve a presentation next week, and I’m on the search for such information.